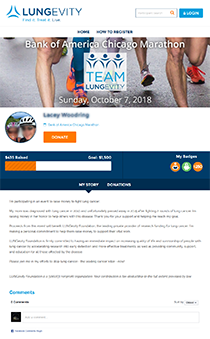 When you fundraise for an event, you not only help spread awareness about lung cancer, you are giving thousands of lung cancer patients and families HOPE. The money you raise helps fund our research, education, and support programs, and we can't do it without you. Follow these simple steps to join us and help end lung cancer! Register and consider starting your own team. 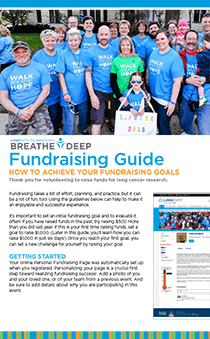 Our Team Captain Guide will show you how to grow your team and meet your fundraising goals. Personalize your page to tell your story, recruit your team, and fundraise. 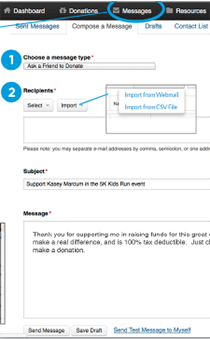 Access your Dashboard for suggested message text on how to ask for donations, recruit team members, and say thank you.